Today I have a secret recipe for a delicious caffeinated beverage served at McDonald’s. A warm, comforting caramel cappuccino made with bold espresso, milk and a buttery caramel flavor. Garnish this drink with whipped cream if you like. Free video shows you how to fix awful trouble-spots fast. Today I have a secret recipe that will show you how to make McDonald’s chicken select tenders at home. These juicy fried chicken strips are made with chicken breast meat. Enjoy these with your favorite dipping sauce. Preheat oil in a large skillet or deep fryer over medium heat or to 350 degrees. Combine chopped chicken, eggs and spices (for the wet ingredients) in a large bowl. Mix well and let set for about 15 minutes. Combine dry ingredients together. Then take nuggets out and bread in flour and spices. Drop one by one in hot oil and fry until golden. When done, drain on paper towels. For sauce, combine all ingredients in a large bowl and mix with a whisk well until mayonnaise isn’t lumpy. Today’s secret recipe will show you how to make one of the tasty sandwiches served at McDonald’s. 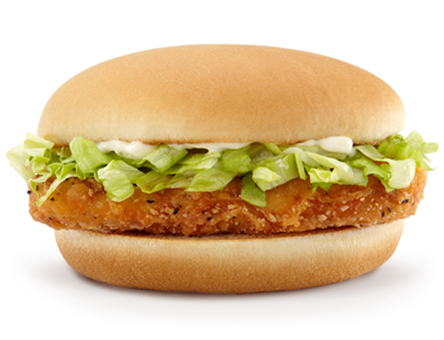 The McChicken sandwich has perfectly crispy chicken with shredded iceberg lettuce and a special sauce on a toasted bun. Enjoy these sandwiches for lunch, dinner or even a snack. Combine the flour, salt, pepper, Accent®, onion powder and garlic powder in a one gallon size zip lock bag. Pound each of the breast filets with a mallet until about 1/4-inch thick. Trim each breast filet until it is round. Coat each filet with the flour mixture by shaking in the zip lock bag. Remove and dredge each filet in the egg mixture, coating well. Then return each filet to the flour/seasoning mixture. Shake to coat. Put filets, bag and all, in the freezer for at least an hour. Cover and refrigerate remaining egg mixture. Deep fry the chicken filets at 375° for 10-12 minutes or until light brown and crispy. As the chicken is frying, toast the buns using the standard method described in cooking regular hamburgers. On the crown side of the bun, apply 1 tablespoon of mayonnaise mixture, followed by 1/4 cup chopped iceberg lettuce. Then top with the cooked chicken patty, and the heel of the bun. Wrap tightly in a 12×16 piece of waxed paper, and let stand 6-8 minutes. Microwave on high, individually, for 15 seconds and serve. Today I have a delicious secret recipe for one of McDonald’s most popular breakfast offerings. 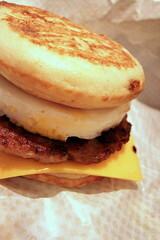 If you haven’t tried a McGriddle yet, then you are missing out on a sweet and savory creation. Two soft, warm griddle cakes with the sweet taste of maple baked right in with fluffy eggs, sausage and cheese in the middle. Pour yourself a cup of coffee and breakfast is complete. Starchy foods require alkaline digestive medium and proteins foods like meat require and acidic medium for digestion. And when you mix both together, the medium neutralize each other. Digestion is impaired or completely arrested. This is very destructive to your body as more energy is require to digest the same amount of food. In a large bowl, mix together flour, baking powder, sugar, and salt. In another bowl, whisk together eggs and milk, and then add to flour mixture, and mix until smooth. In a smaller bowl, mix together 1/2 cup maple sugar crystals with water, and then mix into batter. Set batter aside. Heat a griddle or frying pan and cook sausages. It would probably be easiest just to use pre-made patties, but feel free to make your own! Remove from griddle to paper towel and pat away excess grease. In a bowl, crack eggs and whisk together with 1 cup milk and a few shakes of pepper and salt. If you can get your hands on a rectangle cookie cutter, that will create the most “authentic” McGriddle egg (just pour egg into cookie cutter) or just cook mini omelette style eggs. Cook until eggs are not runny, and carefully move to another plate. Finally, pour about 3-inch wide, and 1 1/2 inch thick circles of batter onto griddle. The batter should be thick. Sprinkle maple sugar crystals on top of pancakes. Flip as needed, until pancakes are browned and cooked through. Make sure to cook two pancakes for each sandwich. Assemble like this: Pancake, sausage, cheese, egg, pancake. *Maple sugar crystals can be found at Whole Foods. 3) Grow Delicious, Organic, Pesticide-Free Mushrooms At Home.